Our Stuck On Sale sticker design template is a powerful way to prompt impulse purchases when you place it on your discount items on the rack or counter; or, market your brand just about anywhere by customizing this design with our easy-to-use online design tool. Custom sticker printing has never been easier! 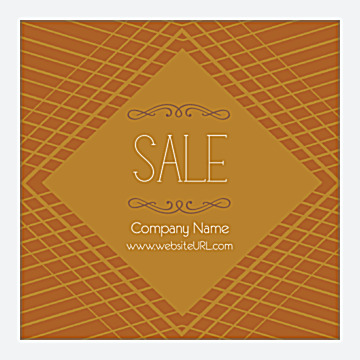 Stuck On Sale features your custom “SALE” text between script art, with your company name and website URL underneath; all in a solid-colored diamond shape to command attention. The background is a two-toned diamond pattern. Choose from five creative color schemes and three unique shapes: square, rounded-corner square, and circle. Then, personalize your sticker design today! Our online sticker maker is the fast and easy way to print custom stickers. All you have to do is pick any of our professionally-designed sticker templates, select your color scheme and shape, then let the online design tool walk you through the personalization process. Edit your text to make your sales items stand out with your unique branding. It’s so easy! You can even share your custom sticker design with colleagues before you print by downloading a free PDF. With premium sticker printing, fast turnaround and reliability, it’s no wonder thousands of companies trust PsPrint to deliver beautiful sales stickers every day. We’re so sure you’re going to love your stickers we even offer a 100% customer satisfaction guarantee. We’re not satisfied unless you’re satisfied! From vinyl stickers to die-cut stickers, sheet stickers to bumper stickers, window clings to wine bottle labels and more, PsPrint is your one-stop custom sticker printing shop. Need something extra special? Our custom printing team can make it happen! Plus, don’t forget we offer a full suite of print marketing tools, including business cards, flyers, and banners.